I made (what I thought was) an interesting statistical discovery while cruising the internet yesterday. Wine-searcher.com is intended primarily as a place where consumers can search for which retailers are offering a specific wine, and how much they are offering it for. It costs a smallish amount ($39) a year to get the full service; I’ve been subscribing for the last couple of years and find it extremely useful. But it does other things as well. You might expect, for example, Asda, Tesco and Sainsbury’s to offer a fairly similar selection, but you’d be wrong. Every standard major English retailer sells more wine from France than from any other country, but at Asda the USA are hot on their heals – French wine makes up 12.64% of their offering, American 12.48% – and at Tesco Australia isn’t far behind (23.79% to 20.7%). The USA’s popularity at Asda isn’t reflected elsewhere – they provide 3.81% of Tesco’s wines, 6.58% at Sainsbury’s and 4.79% at Waitrose. Chile is the fifth biggest producer on Tesco’s list, but seventh at Asda and Waitrose and a miserable 13th at Sainsbury’s. I thought Argentina’s malbecs were big sellers, but in fact they’re an “other” everywhere except Majestic (3.06%) and Tesco (1.44%), which at Sainbury’s means they’re below Belgium, Sweden, Holland and Mexico. Aldi, the discount supermarket chain, is a curiosity: here France limps in joint fourth, behind South Africa, Chile and Italy, and level with Australia, Germany and Hungary. Spain, with 4.76% of their list, are precisely half as popular. As you might guess by those slightly weird numbers, their list is pitifully small with just 63 things on it. 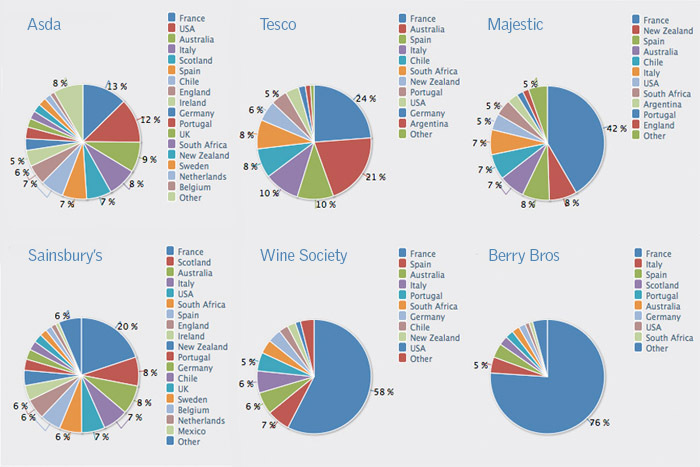 The higher you go up the qualitative scale, the more France dominates – by the time you hit Berry Brothers the French are responsible for a stonking 76.04%. And there are still some surprises: New Zealand is Majestic’s No2 producer, but No9 at the Wine Society and at BBR it’s just an “other”. But I guess the most notable thing is the number of different countries whose wines British merchants list. Here, by way of comparison, are a few foreign retailers. Wine.com, apparently America’s largest online wine distributor, does pretty well (though American online wine retailing is a complicated thing, and I couldn’t find any of the major supermarkets, so I don’t know how representative it actually is), but wine lists in Australia and France look very different to ours, and a lot less exciting. This entry was posted in Uncategorized and tagged asda, auchan, berry bros, majestic, sainsbury's, statistics, supermarkets, Tesco, wine, Wine Society. Bookmark the permalink. Absolutely fascinating – especially the fact that “The higher you go up the qualitative scale, the more France dominates”. Of course, outlets like The Wine Society and BB&R tend also to attract older customers, and perhaps old habits die hard – but even so. Thanks for putting in the work to produce this! This is fascinating, esp. considering the truism that the wines of the moment are Kiwi Sauvignon and Argentinian Malbec, which, as it turns out, is not what the vast majority of people in supermarkets are buying – they’re buying French, (across the board, astonishingly), Australian (despite the move away from what we might call Bridget Jones Chardonnay) and Spanish (well, Rioja) – no surprise there at least. What’s even more surprising is that France, Spain and Australia should all be doing so well based on an average UK supermarket spend of less than £5.00 since all of these regions have become increasingly more expensive.